(Above) A magnificent tramp art wall case with door and drawer. 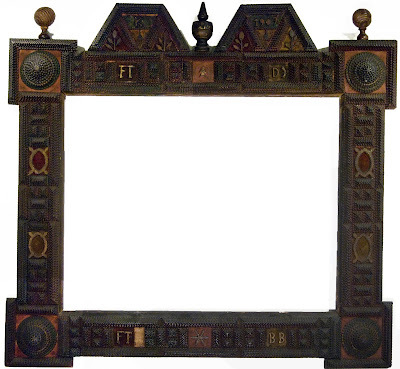 (Above) A tramp art frame, with pronounced corners. 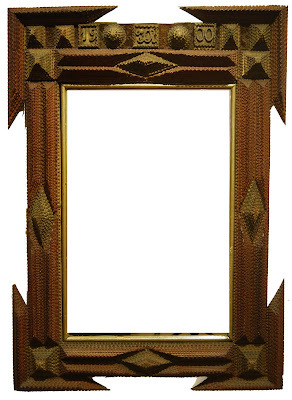 (Above) A beautifully ornate frame, made in the tramp art tradition. 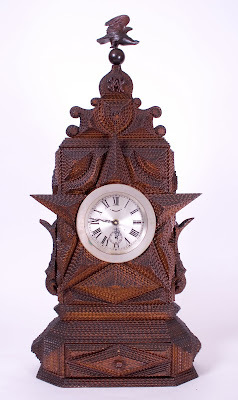 (Above) A stunning tramp art clock case, with drawer. 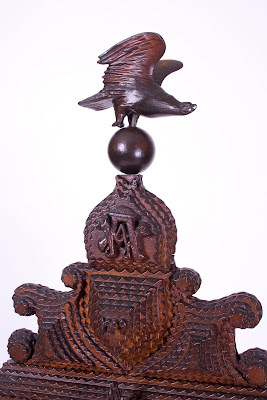 (Above) For detailed and fragile ornamentation like you see above to have survived intact is quite rare. Usually, extensions like these never survive to present day. GEORGE AND SUE VIENER OF READING, PENNSYLVANIA HAVE BEEN MY FRIENDS FOR MANY YEARS. THEY LOVE FOLK AND SELF-TAUGHT ART AS MUCH AS ANYONE I KNOW. THEIR COLLECTING “BUG” finally got the best of them and so they decided they would sell some of their collection. The result is the Outsider Folk Art Gallery, located at the GoggleWorks Center for the Arts in Reading. These tramp art pieces are as fine as any I have seen. Check out all of their art for sale here. If you have questions, this isn’t at all like a lot of stuffy big city galleries. George or Sue will explain anything or answer any question you might have. They have a lot of art to view. 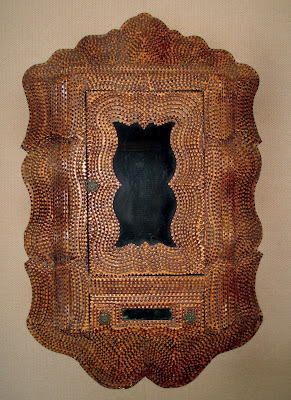 Want that wall case, blows my mind. George and Sue are Good Folk.